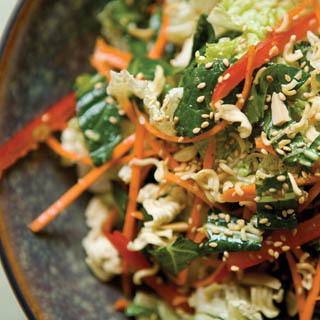 Bok choy and ramen noodles add Chinese flair to this salad. Nutrition Highlights: Napa cabbage, also called Chinese cabbage, is milder than standard cabbage and an excellent source of antioxidant vitamins A and C.
Melt butter in a skillet. Add ramen noodles, almonds and sesame, and saute until toasted. Remove from heat and set aside. In separate bowl, combine vinaigrette ingredients. Trim the bok choy 3 inches from the bottom and chop remaining in one-inch ribbons. Chop Napa cabbage in one-inch ribbons. Add remaining vegetables to cabbage mix. Before serving, toss with noodle mixture and vinaigrette. Nutrition Facts for Ingredients (per serving): Calories – 390, Fat – 27.9g, Dietary Fiber – 6.4g, Protein – 9.4g, Vitamin A – 199%, Vitamin C – 153%, Calcium – 30%, Iron – 26%. Nutrition Facts for Asian Vinaigrette (per serving): Calories – 308, Fat – 27.3g, Protein – 0.3g. Linked up at Summer Salad Sundays, Not Baaaad Sundays, Motivate Me Monday, Made By You Monday, Market Yourself Monday. This salad looks amazing! I love Napa cabbage, and the Asian favors always change things up a little, in a good way! Thanks for sharing this with Summer Salad Sundays, look forward to seeing you again soon! Delicious salad. I substituted one tablespoon of butter for sesame seed oil since I did not have any sesame seeds and also added two teaspoons of the sesame seed oil to the salad dressing. It went over quite well with everyone. Thanks for your feedback, Becky! Sounds like a great substitution.